Outside of Toronto, a famous actor, Arthur Leander, collapses from a heart attack in the middle of a performance of Shakespeare's King Lear. Shortly thereafter, a deadly super-flu quickly spreads and wipes out approximately 99% of the world's population. 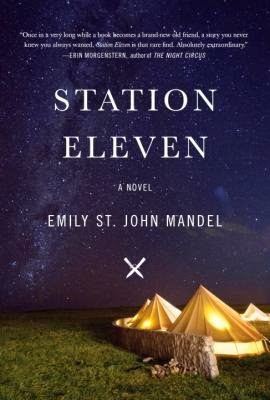 The novel switches back and forth in time, before and after the pandemic, and centers on the lives of Arthur and people connected to him in one way or the other. In the years after the Fall, one of these people, Kirsten, join a group of traveling actors/musicians who are determined to keep a modicum of culture alive and take as their motto a line from Star Trek: Voyager: "Survival is insufficient". This is an excellent example of a post-apocalypse novel done right. The story starts off well, taking hold of the reader and never letting go. The novel maintains just the right level of pace and tension, until the very last page. I would recommend this to anyone who is interested in reading a post-apocalypse novel but are turned off by zombie novels or the tiresome slog that is Cronin's The Passage. In fact, I would recommend this to just about anyone. Fifteen years after a pandemic flu wiped out most of the world's population, what's left of society have come together in small communities trying to survive together. Kirsten is part of a group of actors and musicians who travel from settlement to settlement, performing Shakespeare or pieces of music. The novel jumps between characters who are tied together by a single event just before the pandemic spread, and the threads of the novel jump between the past and present. Certain threads are kept hidden until everything is unraveled by the end. I found this to be a compelling, somewhat haunting tale of a post-apocalyptic society.